Opening day of the Manitoba Rifle season promised to be a good day for us. My boys, Matt (center) and Brendan (right) had methodically scouted a small piece of bush. Although the landowner had never allowed deer hunting with a firearm on his property, the boys somehow convinced him to allow us to hunt during the first week of the rifle season with our muzzleloaders. Sunday before Opening Day we dropped off the "Buck Shack". Several hours were spent making sure of its exact position and adding additional cover to help break up the outline of the 4'x4'x5' house. The Buck Shack was then loaded with Mr. Heater Portable Buddy heater, several 1 lb. bottles of propane, tripod, spotting scope, sand bag, binoculars, range finder and swivel office type chair. The Buck Shack was ready for me to move into Monday morning about 1 hour prior to sunrise. Opening morning was nonstop excitement. 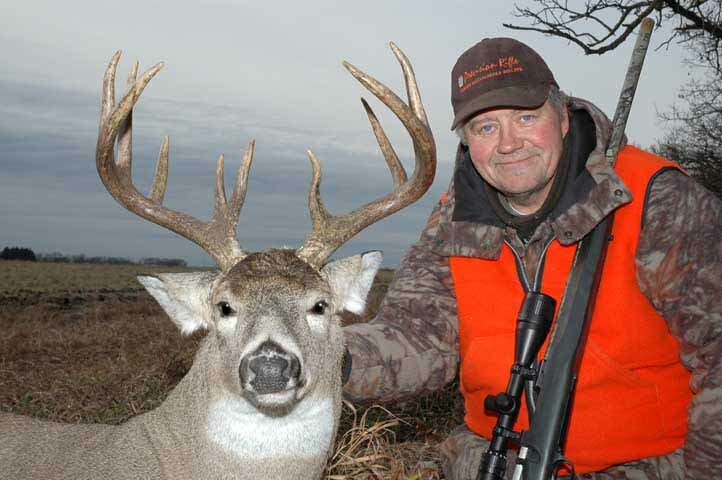 Matt had twelve deer within seventy five yards of his location while Brendan had eleven within sixty yards of his stand. I had four does and fawns and two bucks pass within shooting distance before my morning ended about 8:35 A.M. when this buck came visiting. He first exited cover at about 140 yards but did not offer any shooting opportunity until he hit the second of two scrapes at 162 yards. The 240 grain Dead Center ahead of 40.5 grains of IMR 4759 got the job done almost instantly. In spite of the fact there was no snow, a blind man riding an ATV could have followed the 25 yard trail. For those of us who are as interested in the rifle as they are in the deer, here is the skinny. My rifle is my own design built by me. I started with a Ruger 77 Mk II short action. I added a Hogue Rubber Overmolded Varmint stock with aluminum pillars. The scope is a Tasco 2.5x10 Varmint with mil dots. The 27" long barrel is by Green Mountain .45 caliber 1:30" twist made of tempered 416 stainless steel film dipped camo. The breech plug is also of my design which features a .033" flash hole and is fitted with a shortened 6mm Remington case. Powder ignition is courtesy of a Federal 210 Large rifle primer. The 240 Dead Center leaves the barrel at about 2250 fps ahead of its favorite charge of 40.5 grains of IMR 4759 powder. Accuracy generally runs about .7 MOA with its best day yielding a .778" 200 yard group. Someone once said that Success is when Opportunity meets Preparation. My boys built me the Buck Shack for Christmas 2004. They spent countless days scouting, getting maps, checking crops, more scouting. They gave me the Opportunity. Over two years of design, acquiring the parts, machining, shooting, tweaking, more shooting was my Preparation. 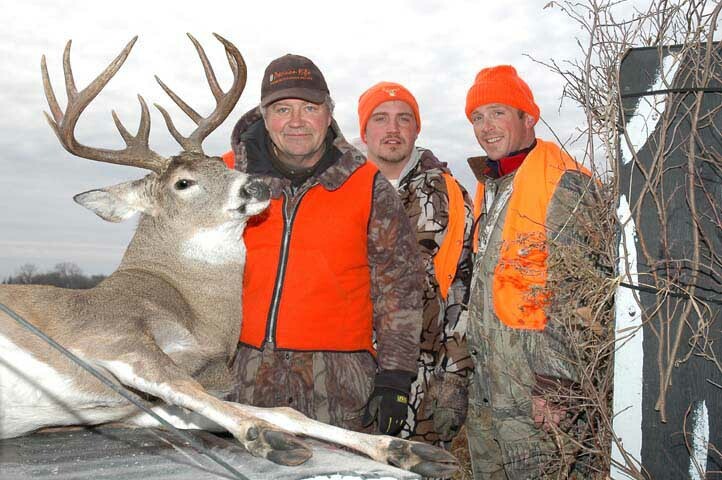 We all shared the Success opening morning, November 14th, 2005.